Red Maple Tree the name implies, the Red Maple's leaves turn a brilliant fiery red in the autumn months. This display should make for quite the eye catcher in the garden as temperatures drop. In the spring, this tree will be covered in tiny red blossoms, female flowers drooping down or males growing upwards. These trees are also a food source for deer and elk in the winter, so expect to see a few in its shade in the cold months. The branches will also provide more than adequate living space for birds and squirrels, giving nature lovers, even more, to love about planting this majestic tree in their yard. Red Maple Tree is a colorful American native, so named for its rich red autumn foliage. During spring it will brighten up your garden with red flowers, in summer its new grown twigs are red, during fall its foliage has a reddish mixture of autumn colors, and in the winter small red buds decorate the leafless tree. This tree is the perfect choice for any garden that could use a splash of color. This species of maple is also known as Swamp Maple, Water Maple or Soft Maple - referring to the fact that this tree flourishes in moist areas. However, a little drought will not harm the Red Maple in the least, making this tree both beautiful and comfortable to keep. 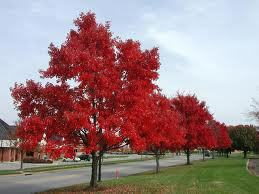 Red Maple Tree is also unique as it can adapt well to all different types of soils. This is a lovely way to bring lots of bright color to a lawn or other landscape and these trees are a trendy one and is seen a lot planted on yards of homeowners. They provide lovely curb appeal as they mature. These trees are easily maintained and are easy to care for as they grow and develop. They are shipped to the consumers from this nursery in bare root form and are very easy to plant. The Red Maple is a deciduous tree native to North America. It is also the most abundant tree in the region. The tree reaches a height of 60 to 90 feet. The leaves of a mature tree will reach 9 to 11 centimeters in length. They are arranged on opposite sides on a twig. The twigs of the tree are reddish and have small lenticels. Also, dwarf shoots are always present on its branches. The bark of the tree is smooth and gray when the tree is young. As it grows old, it becomes darker and splits into raised plates. Red Maple Tree unique shape and reddish tint of the maple leaf make it pleasing all through the growing season, and, in winter pretty red buds appear. In spring, delicate red clusters of flowers blanket the ground, and even the leaf stems have a reddish tint. Fun helicopter seed pods spiral to the earth in early summer. Fall is when the tree truly shines, sporting blazing foliage in hues of fiery scarlet to brilliant yellow. The flaky bark of the tree is a lovely silver-gray color that complements the leaves nicely. The wood is hard and used in a variety of situations from making gunstocks and furniture to being sold as firewood. 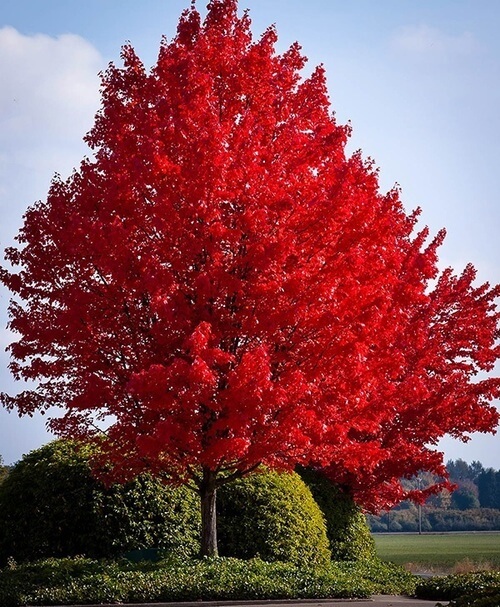 Red Maple trees are a great way to bring color to a lawn or landscape. These magnificent trees will have a reddish tint all year and will be spectacular during the autumn months. It will also be very adaptable to different soil conditions. 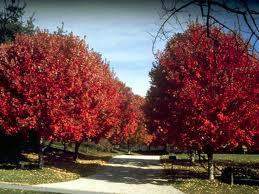 Red Maple trees will make beautiful shade trees for a lawn. This tree will bloom in the early spring months of the year.